The Q3 smartphone market, as should be obvious but somehow isn’t, splits between Apple selling a high-priced product and everyone else selling much cheaper products. Android’s ASP (Average Selling Price) is just under $300. The wholesale price of the iPhone 3GS - the one people call ‘free’ - is about $375-400. In other words, the cheapest iPhone is still 1/3 more expensive than the average selling price of Android phones. Meanwhile, Nokia and Apple both sold about 17m smartphones - but that’s not a very relevant comparison. The other obvious observation is that iPad is selling far more than any other tablet, but then everyone knows that. Secondly, the global handset market. People tend to ignore the bigger picture, but this makes the polarisation of the market even clearer. 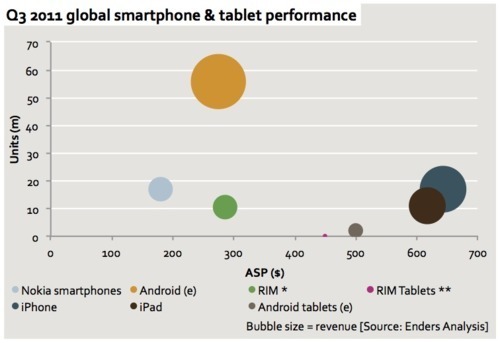 Nokia, Samsung and Apple have scale - everyone else looks rather challenged. Even HTC looks sub-scale, while the weakness of LG is also very obvious. Also, there’s the ‘Other’ category, powered by Mediatek, EMP, and Qualcomm (amongst others) and growing relentlessly in the low-end. There are now hundreds of vendors in this space - if you can make a pocket calculator you can make a phone. 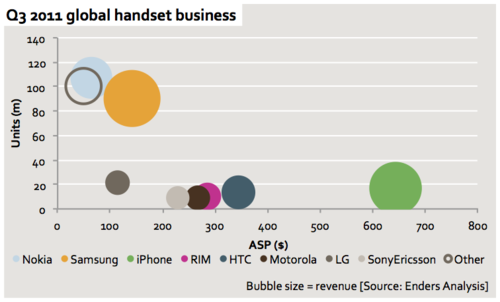 Caveat: the LG and Samsung volumes and ASPs are estimates, as is the ASP and revenue for Android. RIM numbers are for the August quarter and RIM tablet is an estimate of sell-through. The rest of the data comes from the companies. Lots more at Enders.